YoBaby Turns 10 — You’re Kidding Me! When I hear things like “YoBaby Turns 10” I am reminded how old my daughters are now. Sometimes I ache for the days when they were younger with chubby thighs and pudgy cheeks. Now they’re 11 and 8 and aren’t babies anymore. Sigh. I’m starting to fret about college these days instead of trying to figure out the best stroller for my little ones. Time does indeed fly! I have been a Stonyfield Farm loyal customer for years and am thrilled to share this good news for your growing toddlers. 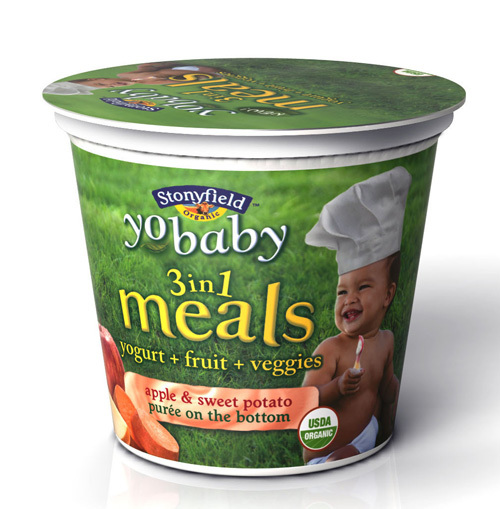 YoBaby now offers a 3-in-1 meal for your baby. There is now yogurt, protein, and a veggie in each 6 ounce cup in these great flavors: Pear & Green Bean, Peach & Squash, Apple & Sweet Potato. Yum!